DELTA ROV INC was founded by Mr Etienne Demers as a result of a client request to have a cost effective, reliable, high standard ROV company in the Philippines. It was incorporated in February 2015 and is now fully operational. Although it is a young firm, it benefits from the combine experience of it’s directors and employees. We aim at providing best in class ROV services, Bluerobotics distribution, service, support and training. Where other companies may be focused on maximizing profits, our target is to be the number one recommended ROV service provider. We believe we can achieve this goal by operating to the highest standard in the industry whilst keeping our cost at par with the international market. Our slogan is “Exceeding expectations”. We believe this sends a clear message to everyone of how we set goals for ourselves and how we intended in performing on every job entrusted to us. Combined with this driving force, our level of technical knowledge and our experience in the ROV industry, we believe that we can live up to our promises. We therefore follow IMCA guidances, DVN regulations, ISO 9001, NEBOSH safe work practices and standardized every process within our company whether for shore or offshore work. As we set high standards for ourselves, we also believe we can improve and welcome any 3rd party audits to help us achieve our goals. Delta ROV inc prides itself in being a honest, trustworthy and transparent business. Violating the Philippines Anti-Graft policy is a crime which we do not take litely. Any suspicious activity will be reported and treated as a threat to our business. To be clear, we do not accept or paye bribes in any way shape or form. At Delta ROV we are committed to the health and safety of our employees and believe it is our duty to operate with a minimal impact on the environment. The first thing to admit is that ROV operations and manufacturing are sectors which include risks to human life and environment. A lot of jobs can be made safer by adhearing to our safe work practices. We have developed a complete HSE program to help our employees work safely in this challenging environment. Our HSE stay S.H.A.R.P. program is designed to focus the attention of our work force towards a thinking process before the start of any work. This thought process is recorded and reviewed using a standard Job Safety Analysis form. This allows the experience between our staff to be shared and determine how to proceed safely. In the end, working safely will always be more cost effective. 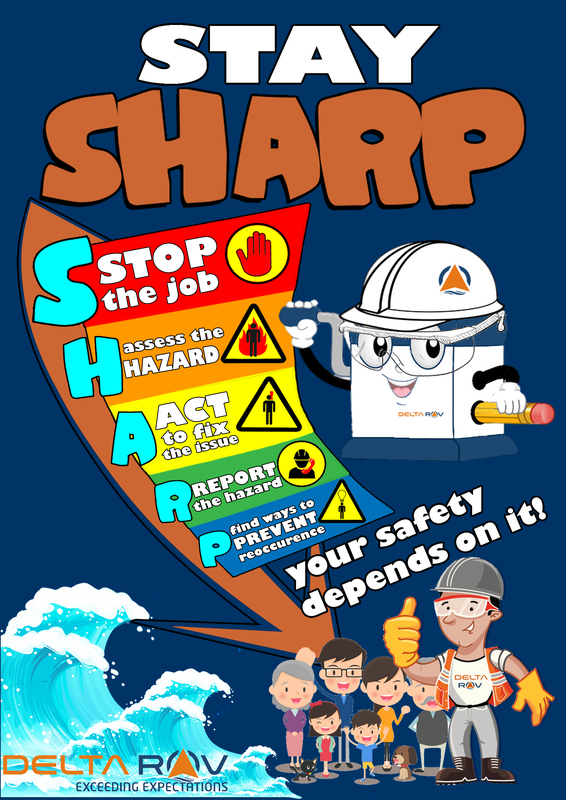 Always remember that there are no work so urgent that cannot be done safely and that safety starts with you!